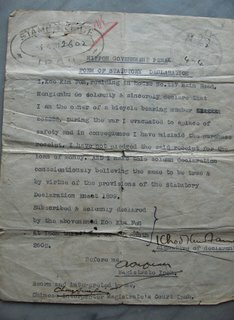 This declaration letter was neatly type-written in English and is nearly 65 years ago. It was a declaration of ownership of a bicycle. To make it legal and binding, it also bore the officially stamped of the Stamp Office of Perak. Had it not been for the date and the other stamps on it, it would have been another court document from the British colonial period. However pouring thro the details, it unravels more than what that meets the eyes. It reveals an anachronism that could only be found in the history of that time. For the document was issued in the name of the Nippon Government of Perak. It was declared before the Magistrate of Ipoh on the 3th of April 2602. The year was by the Imperial Calendar or Koki. After which the document was probably taken to the Stamp Office of Perak to be stamped, for the Stamp Office chop was dated 4th April and with the year 2602 written over the Gregorian year 19XX. However there was a higher authority which the Nippon Government of Perak had to accede to and i.e. the - 军政部 / IPO机关 – Gunseibu IPO kikan – Military Department / Ipoh Operation. The stamp from the Military Department - Gunseibu - was ubiquitous on all documents and photographs from that era. In addition to the two stamps above, the document also bears the stamp of the Magistrate. 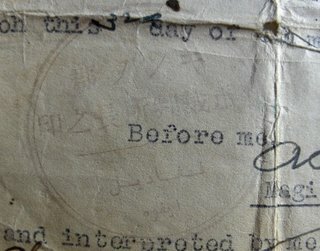 The stamp is faintly visible in the photograph, next to the Magistrate signature at the bottom of the page. What is unique and interesting about this stamp is that in addition to the Japanese Kanji / Katakana, it also has two lines of Arabic alphabets on it! The Arabic alphabets is Jawi Malay for ‘Pegadil, Ipoh’ which means ‘Judge, Ipoh’ written in the Malay language. This document could only be a product of that era. A document issued by the Nippon Government of Perak based on the British Colonial law, stamped with a Magistrate chop in Japanese and Jawi Malay, and wetted thro by the Military Department. One ponders why the Jawi characters in the magistrate stamp and what subtle message was the Japanese military ruler sending to the local populace. Were there here as liberator instead of being the new master? 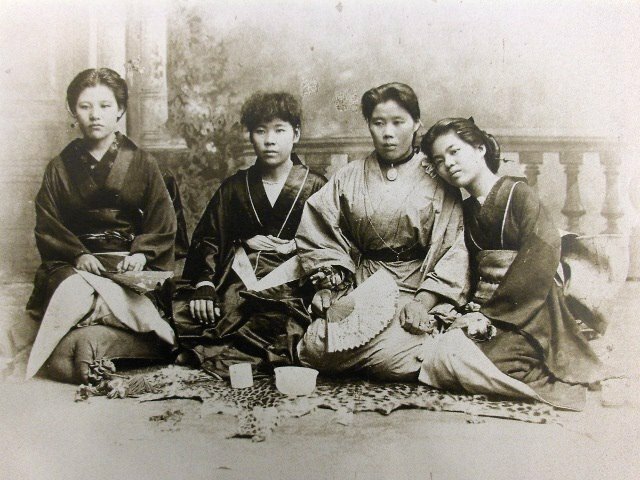 For the Japanese military, in order to win support for the wartime regime, held out promise of self-government to Sout-East Asians, and in a limited way involed the indigenous elite in the adminstration. It was the start of the new regime, and the use of the Jawi in the stamp could be a way for the new ruler to send this message thro - the building of the Greater East Asia Co-Proseperity Sphere - 大東亜共栄圏 Dai-tō-a Kyōeiken - " an attempt by Japan to create a self-sufficient "bloc of Asian nations led by the Japanese and free of Western powers". This Boxing Day will be the 65th anniversary of the fall of Ipoh to the Japanese occupation force. On 25th Dec 1941, the last of the British forces destroyed all they could before leaving the town, and the following day, the 6th Division of the Japanese army marched into town. The force move continued its southward march and Singapore fell on Chinese New Year of 1942, Feb 15, about a month and half later. The making of a person stamp is possibly kept alive nowadays in Chinatown because of the tourist trade. This tradition of keeping a personal seal, though is now mainly confined to the artistic community who practices Chinese calligraphy/ painting. In Japan, the culture of owning a hanko ( 判子) is still commonly practiced among the general population to this day. One can stamp a check using a hanko which bears one’s name. Jawi Malay was commonly used among the Malay community before the introduction of Romanized Malay. It was used way back during Raffles day, for the treat which Raffles signed in 1819 with the Temenggong and the Sultan was also written in Jawi. The Hikayat Abdullah the autobiography of the Raffles Malay tutor was written in Jawi. And the National Museum has the original will of the Munishi, as Abdullah was honored as the learned one, written in Jawi Malay. I, Koo Kim Fan, residing in house No. 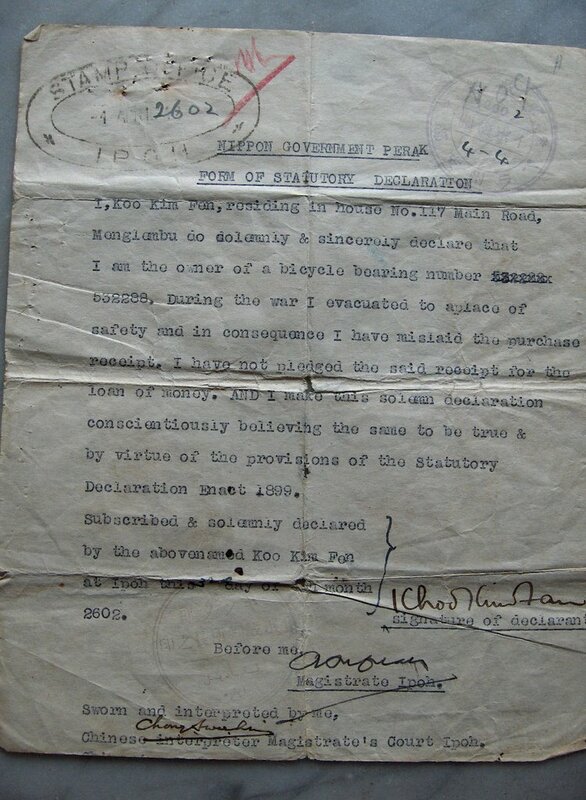 117 Main Road, Menglembu do solemnly & sincerely declare that I am the owner of a bicycle bearing number xxxxxxx 532288, During the war I evacuated to aplace of safety and in consequence I have mislaid the purchase receipt. I have not pledged the said receipt for the loan of money. AND I make this solemn declaration conscientiously believing the same to be true & by virtue of the provisions of the Statutory Declaration Enact 1899. A) The Chinese characters are in Standard Chinese (PRC) and not in Japanese Kanji, due to computer/software limitation. B) this was the same bicycle in the previous article in which the bicycle tax was paid. This receipt is a little more the size of a cinema ticket counterfoil, but the writing on it tells the story of a bygone era. 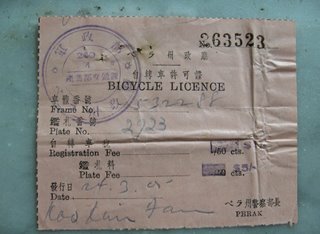 The receipt was for a Bicycle Licence and was issued on 24.3.05 by the Perak Police Chief under the Japanese Military Government. It is interesting to note that the date of the receipt, 24th March had the year counted as 2605, which was by reckoning of the Koki or Imperial calendar. This was equivalent to the Gregorian calendar 1945 or 20th year of Showa (昭和). During the War years, the Koki calendar together with the Showa reign-year calendar of then Emperor Hirohito, was used in the territories occupied by the Japanese. Koki took its count from 660BC, the start of the reign of the mythical Emperor Jimmu, the first emperor of Japan. For it was said that to gain historical milestone and that Japan had as estemeed a pedigree as its ancient neigbours, the Koki calendar was adopted. Shonan-to too was no different. The Gregorian calendar was abandoned, and the Koki/Showa calendar was promulgated across the land. Thus The Shonan Times, which was the renamed The Straits Times, had the year 1942 printed as Koki 2602 , Showa 17 . Why was the famous Japanese fighter plane that dropped its bombs in Singapore on the early hours of 8Dec 1941 known as the Zero Fighter, (the Mitsubishi A6M ) ? For it was intimately connected to the Koki. The last two digits of the Koki were used to date all military equipment up to 2599 i.e. year 1939. After that, only the single digit was used. The Mitsubishi A6M was adopted in the Koki year 2600，i.e. 1940, and thus named the Rei-shiki Sentoki （令式战斗机）, in short Rei-sen （令战）or Zero Fighter. Zero being the last digit of the Koki year 2600. The Koki calendar was abolished when the War ended. Though in Japan, the Emperor reign-year is still widely used by the population. This is the 18 year of Heisei (平成). The Heisei year began in 1989 when Emperor Akihito came to the throne. Heisie 1 is known as Heisei Gannen (平成元年). 1. Digging thro the pile of papers in the Made in Germany safe by Siemen’s Martin Steel, which guaranteed Fire & Burglar Proof, was this little receipt measuring 7.7cm by 9.6cm. It has been kept in the safe for the past 61 years and more. (Note: The Chinese characters used are Standard Chinese (PRC) and not Japanese Kanji. 4. 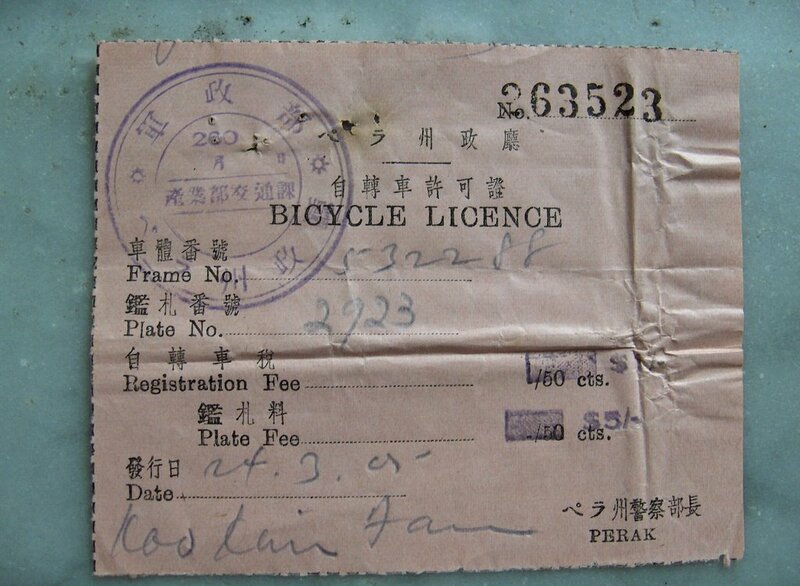 The Registration and Plate fees were printed as 50cts, possibly in 1942 when the Japanese Military Government was established in Perak. Subsequently by 1945, the Plate fee had increased to $5/-, and inflation of 10 fold over a period of 3 odd years. The last two weekends was spent in the National Library pouring over books of old photographs and researching on when photography first came to the island. It is deeply interesting to study what lies behind the old pictures be it the landmarks, geographical or man made or the people, and see how they have changed over the ages. It links us back to the past and gives us a sense of belonging to the place. Sadly to say, not much is left in the city of buildings that are over a century or more old, and the old photographs help fills the historical gap in our visual void. Last Saturday, it was up Bonham Hill (aka Fort Canning) again, and this time was not so much to look for the fabled kings, but to check out the spots that where the photographers of old had taken those shots, and to ponder on the change. 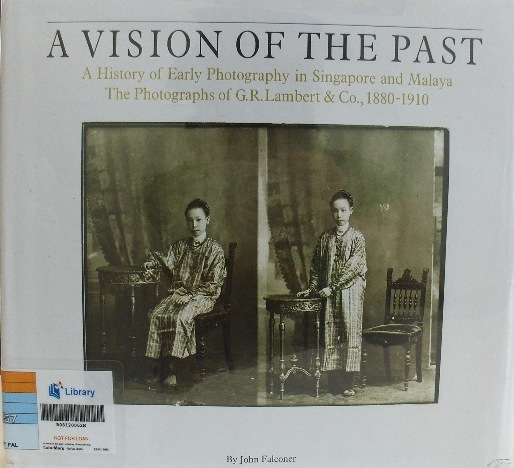 The photographs here were taken from Fort Canning overlooking the Singapore River across to Boat Quay and between them they span a period of over 160 years. And over photography has gone from daguerreotype to digital. 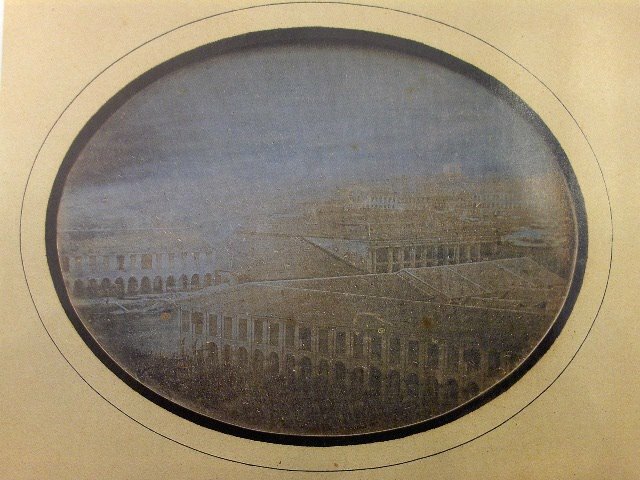 The picture above is said to be probably the earliest surviving photographic image of Singapore. It is a daguerreotype print taken in 1844 by Jules Itier, a Frenchmen. Itier was the head of a commercial mission to China and the Fart East. While on a stop over in the settlement he went around town to capture the touristy sight with his bulk camera. Being a daguerreotype print the image is laterally inversed, and to view this picture in the proper perspective I had to look at the reflected image in the mirror. It then makes sense that the buildings in the fore ground on the left were probably a row of shop houses at the junction of Hill Street and North Boat Quay. 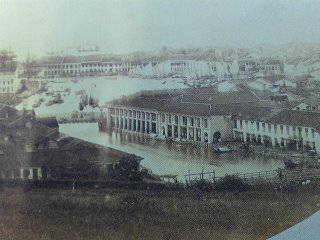 The row of building behind it is the shop houses along Boat Quay on the opposite side of the Singapore. The photograph in the middle was taken by Sachtler & Co in 1863, and twenty years on with the wet collodion positive and collodion negative process photography improved by leaps and bound. The two bridges which were the predecessors of the Elgin Bridge and Coleman Bridge are clearly visible in the picture. In 1862, an iron bridge was imported from Calcutta to replace the wooden footbridge called the Thompson Bridge, and was renamed Elgin Bridge, after the Lord of the same name who was Governor-General of India, 1862-1863. Coleman Bridge spanning New Bridge Road is seen in the right lower corner of the photograph. The two rows of building in the middle is where the Riverwalk Apartment is now. These two storey shop houses have very prominent covered five footways in the shop front, and five foot ways was a building requirement laid out in the Jackson Town Plan. 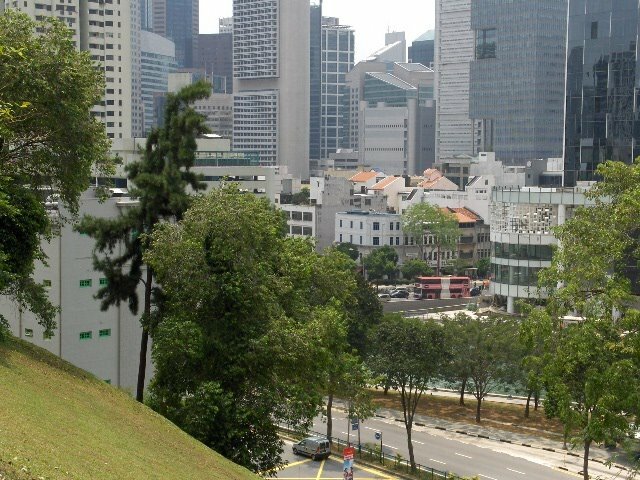 The picture on the left was taken from the same vantage point on Fort Canning as the 2nd photograph. It was taken last on 28 Oct 2006, 12:11pm and as a 182kb JPG file take with a digital camera. Coleman Bridge is dwarfed by the high rise building around it, and a red double deck bus was just crossing it. The Singapore River is partly hidden by the trees planted along River Valley Road. A picture tells a thousand words. It tells the past to the present, and the present to posterity. It has become a hobby of mine now to pour over old photographs, and it’s a habit of mine nowadays never to leave home without a camera, and a digital one for that. 1. Bukit Tuan Bonham or Bonham Hill was the Malay name for Fort Canning. It was named after Sir Samuel George Bonham, Resident Councilor from 1822 to 1836, then Governor from 1836-1848. In the later part of the 19th century it was called Bukit Bendara (Flag Hill) by the Malay. Prior to Raffles arrival, it was Bukit Larangan. 3. The first commercial photographic advertisement appeared in the Singapore free Press. 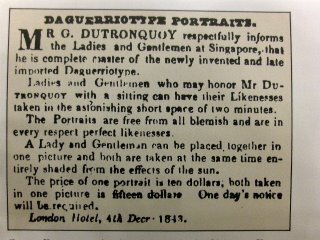 “Mr G Dutronquoy respectfully informs the Ladies and Gentlemen at Singapore, that he is complete master of the newly invented and late imported Daguerreotype. Ladies and Gentlemen who may honor Mr Dutronquoy with a sitting can have their likenesses taken in the astonishing short space of two minutes. The portraits are free from blemish and are in every respect perfect likenesses. A Lay and a Gentleman can be placed together in one picture both are taken at the same time entirely shaded from the effects of the sun. The price of one portrait is ten dollars, both taken in one picture is fifteen dollars. One day’s notice will be required..
London Hotel was located in High Street. 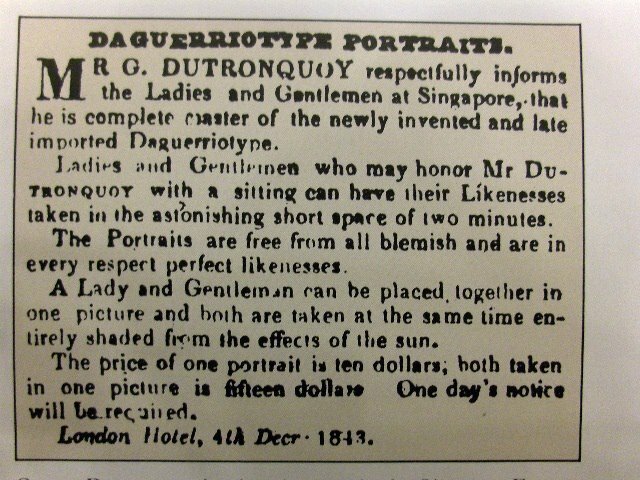 Gaston Dutronquoy arrived in Singapore in March 1839 and it was recorded that he probably disappeared while prospecting for gold in Muar, 1857. G.R. Lambert from Dresden opens photographic studio at 1 High Street, Singapore, 10April 1867. Became the premier photographer in Singapore spanning from 1870-1910 and left a wealthy collection of old photographs of SEA. Was the official photographer to the colonial government and the royal photographer to the King of Siam. Spanning the period 1908 to 1911, had in its employment as Assistant at least 3 Japanese national. 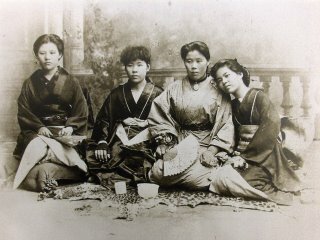 The photograph of the karayuki-san was taken by GR Lambert in 1890. Premier Chinese Artists and photographers, 58/4 Hill Street, Singapore ca. 1910-1923; proprietor Lee Keng Yan, with photographic work undertaken by Lee Fook Heng. 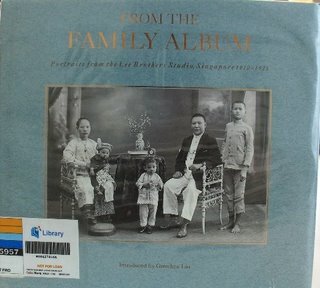 Introduced by Gretchen Liu, National Heritage Board, Landmark Book.